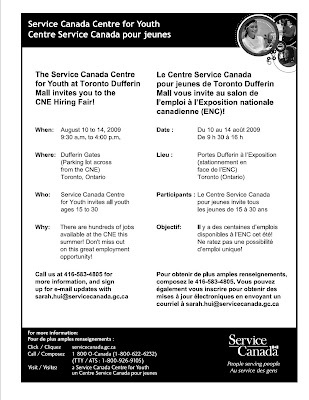 The Hiring Hotline: CNE Hiring Fair starts today! CNE Hiring Fair starts today! The CNE Hiring Fair, hosted by the Service Canada Centre for Youth - Toronto Dufferin location is set to begin at 9:30am this morning. There are hundreds of jobs available - for a list of who is hiring and what jobs are available by clicking here. This year, the hiring fair is at the CNE - Dufferin Gates, in the parking lot across from the CNE and Medieval Times. To get there, take the 29 Dufferin bus from Dufferin station and get off at the Dufferin Gates stop near a large arch. From there, look for a large tent with trailers and people standing around - that's where the job fair will be. Now when you arrive, you'll have to sign up for an interview time and you can only sign-up for one spot - if you'd like another interview, you'll have to go to the back of the line and wait. Interviews are scheduled within a certain time block on a first-come, first-served basis. For example, if an employer says they'd like to interview 20 applicants, only the first 20 applicants will get an interview spot - and most of the interview spots, especially with the popular positions, will go quickly. Now, because the job fair runs throughout the day, you might have to schedule your time at 9:30am and then wait until 2:00pm for your interview. I advise bringing some sort of activity to keep you busy (e.g. bring a book, hand-held game system, cards, etc.). Also, think about bringing some snacks and water as the closest restaurants are north on King Street West. And as with any job fair, make sure you have a knockout cover letter and resume ready. Try and personalize both your resume and cover letter if possible using as much information you can gather from the job listings. At the same time, I recommend bringing extra copies of a more generic resume just in case there are interview openings or no-shows - you might decide at the last-minute you'd like an interview for another job. I also recommend dressing in a business casual way - don't go overly fancy because it can get hot waiting around. But you can't go wrong with a nice pair of khaki chinos and a white button shirt. P.S. There will also be Youth Services Officers around to help you understand the entire process and, if necessary, create a resume and cover letter. Plus, there could be a trailer with computers and a printer available - but don't count on it! You're better off coming prepared with everything you'll need to land your ideal job at the CNE! holy smokes...i wish i found out about your site sooner. thanks for the post! No problem! And just so you know, the job fair is going on until Friday, August 14th - there's still time to find a job!